Here are two photographs of Congresswoman Lynn Jenkins, CPA. She grew up on a diary farm near Holton and graduated from Kansas State University and Weber State College in Ogden, Utah, where she studied accounting and economics. Following graduation, she became a Certified Public Accountant and practiced public accounting in the private sector before entering public service in 1998. 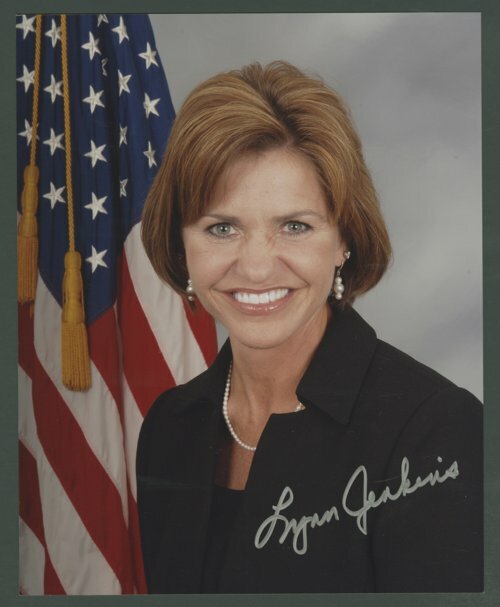 After serving four years in the Kansas Legislature, Congresswoman Jenkins was elected the 37th State Treasurer of Kansas in 2002 and served until 2009. In 2008, Congresswoman Jenkins was elected to Congress, representing the Second District of Kansas and is serving her third term. She is Vice Chair of the House Republican Conference during the 113th Congressional session. Congresswoman Jenkins sits on the House Committee on Ways and Means.